When I was little, my paternal grandmother had a recipe for meatballs that was a family favourite with all 6 of us. It was passed to my mother and so became the family’s most requested meal, especially when I used to come home from uni for weekends or holidays. My grandmother would make them when we asked including on one memorable occasion when she added a shake of chilli powder too many – we couldn’t eat it and it’s gone down in our family history. The downside to meatballs this way is the sheer amount of labour and time involved in the preparation of said balls. The chopping, the mixing, the making…oh and the flour and water that goes everywhere. The family recipe calls for rolling the meatballs with wet hands and then coating them in seasoned flour. The combination of flour, beef and water results in a disgusting gluey mess which takes forever to wash off. Then there is the frying off to brown them before they are dropped into the sauce. The problem with frying them is that I tend to end up burning them – the flour doesn’t help and then the whole dish tastes a bit of carbonised onions. Given that I love meatballs, as does Husband, I was never about to give up making them. So imagine my unbridled joy when I found a recipe in Nigella Lawson’s “Feast” book, for no fuss, no mess meatballs. Oh yes, Nigella had saved dinner and I was in her debt. I’ve adapted her recipe ever so slightly on account of personal taste but her essence remains; simple, delicious and incredibly comforting. The recipe is very easily doubled and freezes brilliantly so naturally I now only make double quantities and freeze it for lunches and lazy dinners where neither of us can be arsed to cook. 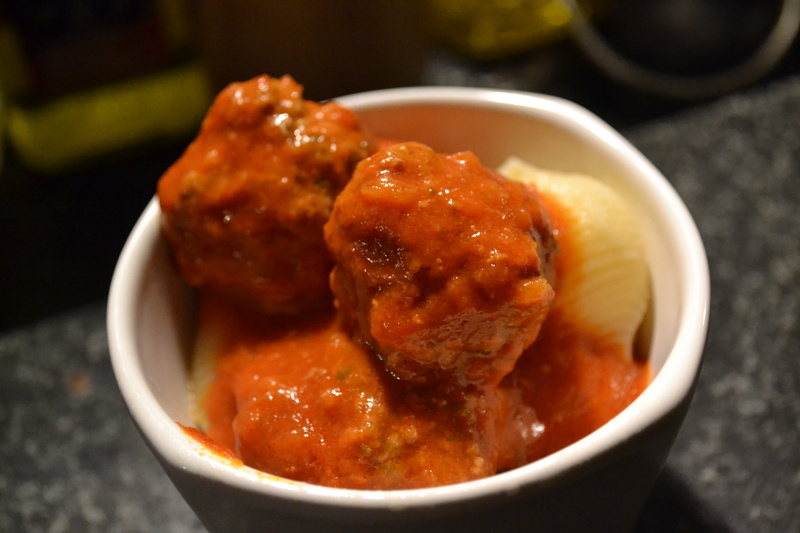 1) Stick all the ingredients for the meatballs into a bowl and mix with a fork or hands until combined. 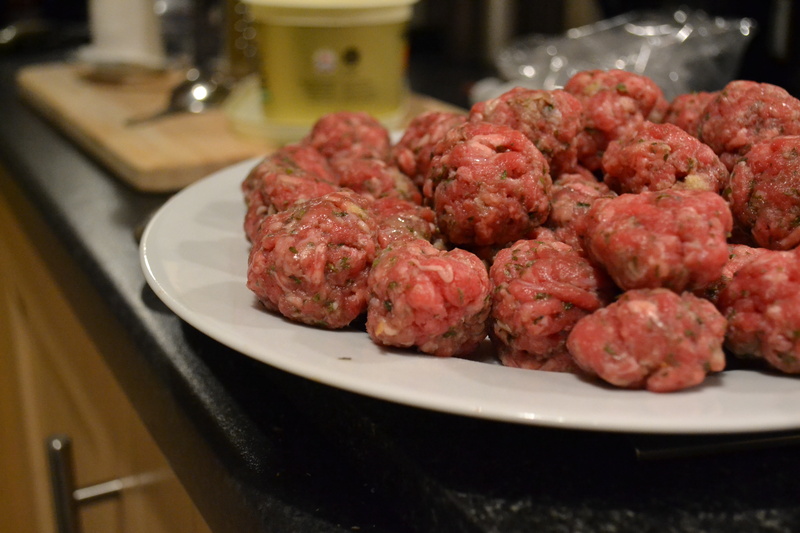 Form into small balls (about the size of a large walnut) and when all the mix is used, stick the meatballs on a plate, cover with cling film and stick in the fridge. The less the mix is handled the better so don’t fret if they are not perfectly spherical. 2) In a food processor, blitz the onion and garlic until they resemble a pulp. If you haven’t got a food processor, use the fine side of the cheese grater. You’ll get the same result…but you might cry more. Heat the butter and oil in a large, heavy pan and cook the onion and garlic mix for 10 minutes over a low heat. Do not allow the mix to colour or it will just taste weird – you want it soft and aromatic, not burnt and bitter. 3) Add the passata and the same quantity of water (fill the carton/bottle with water and swill out to get all the tomato) to the pulp and add the sugar, season with salt and pepper. 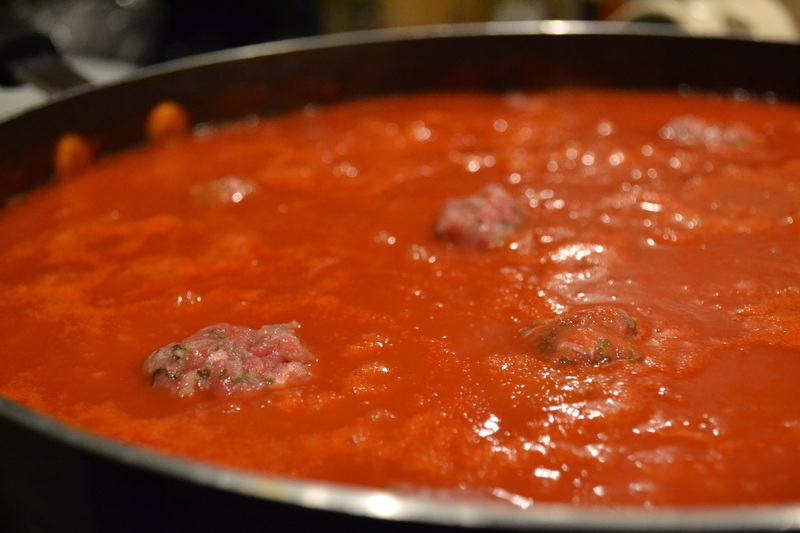 Allow to cook for 10 minutes on a slow bubble and then drop the meatballs into the sauce. Do not stir as the meatballs will break up. 4) Stick a lid on the pan so it is almost totally covered and simmer for 20 minutes, stirring very gently after 10 minutes. 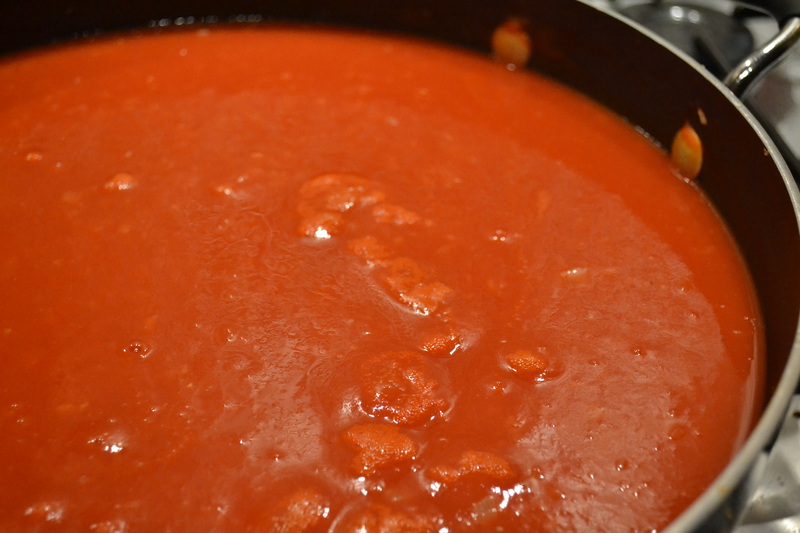 Taste the sauce – if it tastes a bit too sharp, add a knob of butter and stir. Allow to cook and taste again. 5) When the meatballs are cooked and the sauce thickened, serve with pasta (or as Nigella suggests, rice). When cold, they are perfect if you feel the need for a meatball sandwich, using the sauce as a spread within. Reheated, with a serious amount of spaghetti and a good drenching of grated cheese, it makes a very quick and satisfying dinner. Or whatever meal you decide to have it for. Either way, Nigella is my queen.